Coming in to Shillong from Guwahati the road passed over the dam on the Umiam river. We had a quick glimpse of the enormous lake before the Clan Bus turned on to the bridge. On one side of the dam I could see large pipes threaded through the channel of the old river. They lead to a power generating station (approximately) 150 meters lower down. I was reminded of the time, five years ago, when we’d stood on the far side of the lake and watched the sun go down over a lonely fisherman in his boat (featured photo). The sun was going down again (photo below), although the day was not as spectacular as the previous time I’d come here. This second time round I found the place quite as charming as I remembered. 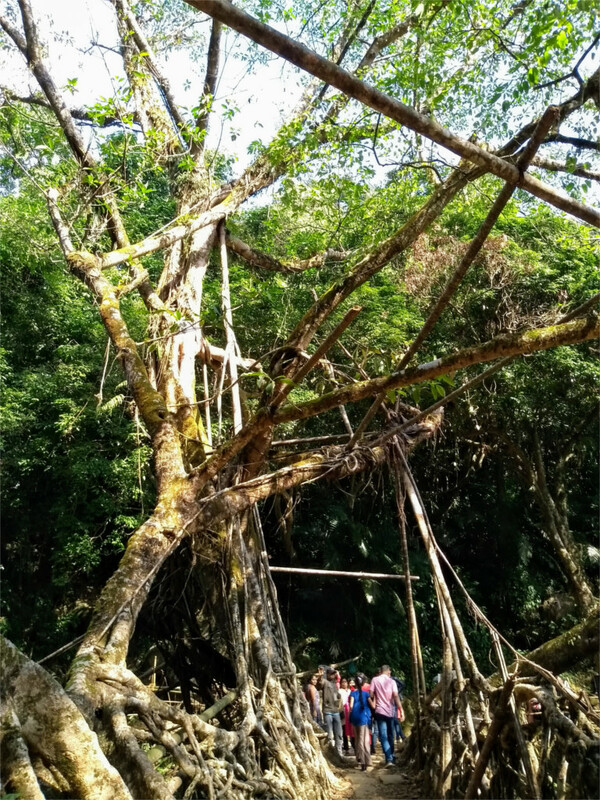 This 220 square kilometer lake was created by damming the gorge of the Umiam river in the early 1960s. That was a more idealistic, more naive, time. 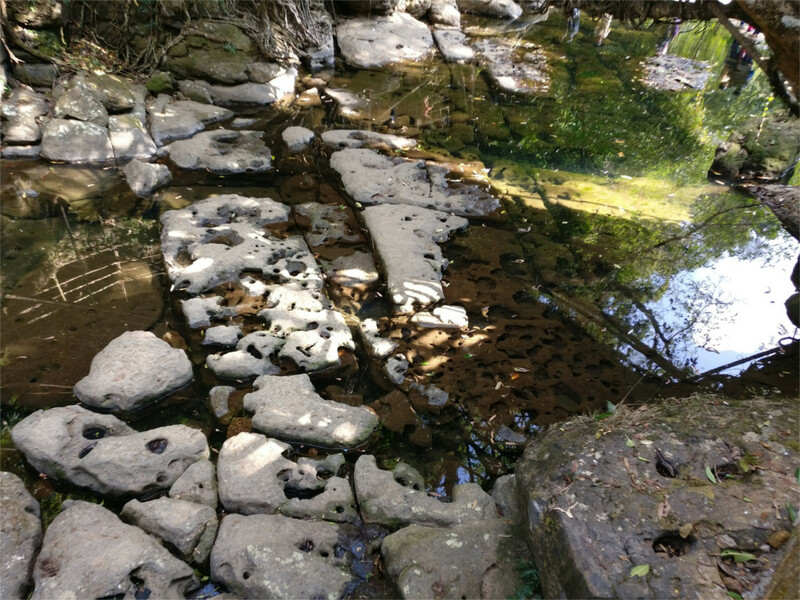 Little was known about the smaller questions of geology: how much silt is carried by rivers, how future deforestation would affect waters, how often small earthquakes occur. The inauguration of the project, eventually costing USD 15 million, on January 9, 1960 by Nehru signalled the opening of the flood gates of US aid to India, in the form of PL-480 funds. Across the world new dams were being erected. The previous day Gamal Abdel Nasser had inaugurated the Aswan high dam. In those days engineers and planners didn’t think of the rapid silting of these dams, or the incredible amounts of bio-waste which would be discharged, untreated, into the rivers of the plateau. 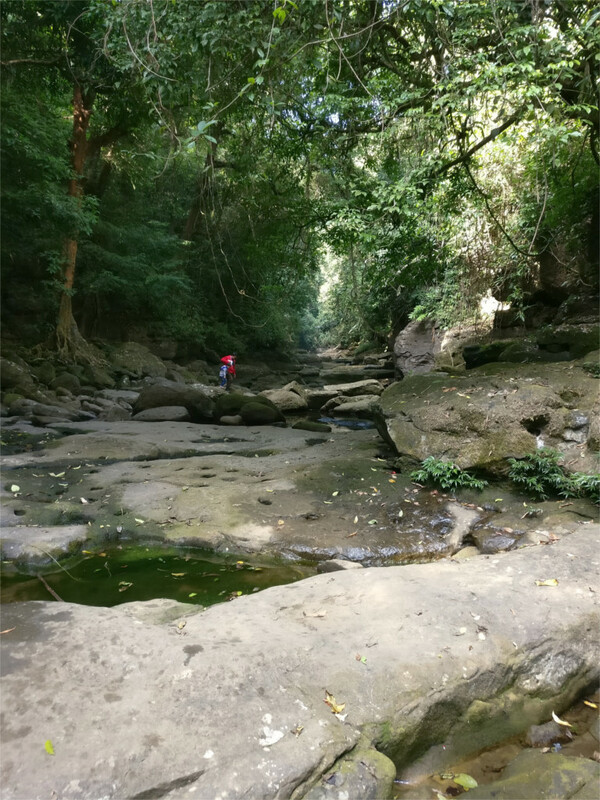 The north-east of India is also geologically unstable, being caught between the Himalyan arc in the north and the Indo-Burmese arc in the west. In 1897 there was an earthquake of magnitude 8 on the Richter scale; the Shillong plateau rose up by about 11 meters (yes, meters!) as a result. A dam would not survive an earthquake of this kind. Smaller quakes, of the kind which happen a couple of times a decade also call for regular maintenance of the dam. The Clan Bus stopped at a spot designated as a viewpoint. 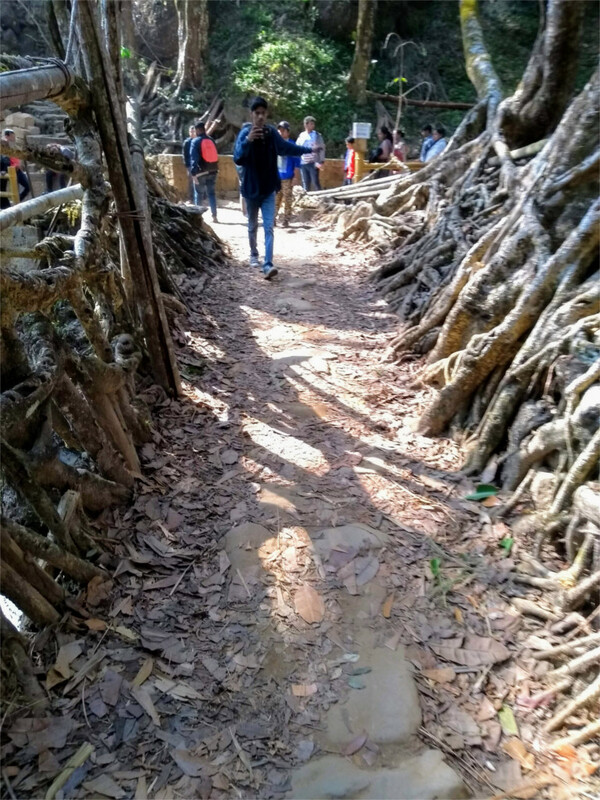 This meant, of course, that most of the view was obscured by shacks and temporary structures built by people who are eager to sell you tea and snacks. We walked down the bank until we could get an unobstructed view of the lake. The calm surface was broken by the wakes of speedboats; apparently the lake has become popular as a sports destination. What a strange thing to do to the water supply, I thought. That was before I discovered that the lake’s water is so polluted that it would require heavy cleaning to be potable. I took this last photo, like the first one, five years ago. I found that I love to stand here and stare at the calm waters of the lake, watching the sun go down. But this calmness is deceptive. We got off the metro at the Zhujiang New Town station and emerged blinking into this showpiece set inside the Tianhe district of Guangzhou. That elegantly curved shell of a building (featured photo) must be the Government Affairs Service Center. The gold building behind it was not a Trump Tower but something called the Nanyue Mansion. Behind that you can see the building which has the Agricultural Bank of China. 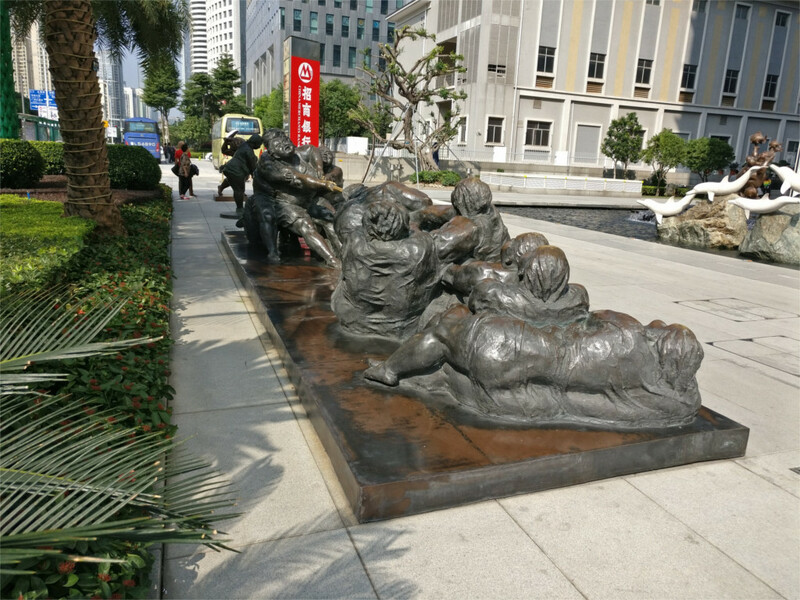 We gawked, clicked a few photos and crossed the road to stare at a small plaza full of the whimsical public art of China. It was lunch time, and I’d located a branch of a famous eatery in a building down here. 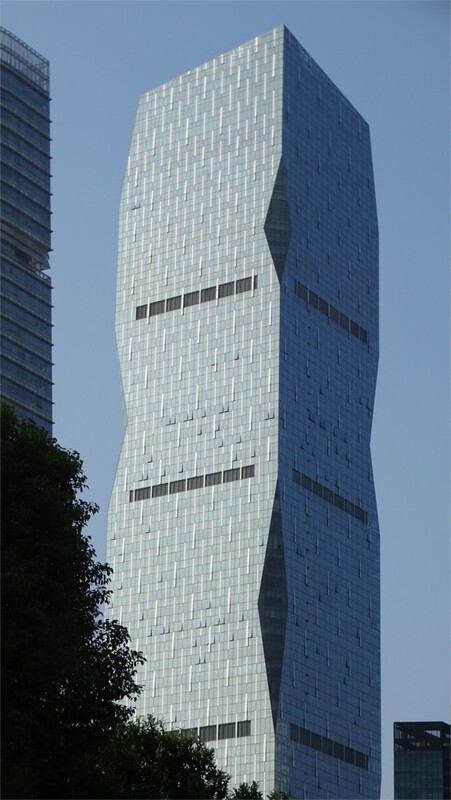 This is the new central business district of Guangzhou. Banks and other financial institutions, government buildings and technology companies occupy the high rises in this new town. We’d first thought of finding a hotel here, before we realized that the Liwan district would be more fun. The tower that you see above is not one of the tallest, but I found the shape very attractive. I wouldn’t mind an office in one of the flat diamond shapes cut out of the corners. I’m sure the view would be excellent. 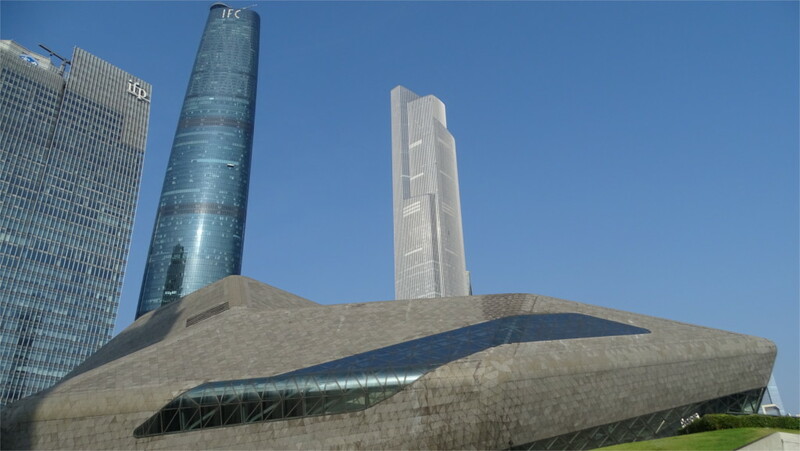 The tower stands right behind the opera house, and faces out towards the Guangzhou library and the Guangdong museum (below). These buildings together define the heart of the cultural center of the new town. Between them runs a garden (Flower City) which crosses several blocks in its north-south alignment. Below this garden lies the Automated People Mover (APM) rapid transit system. The APM connects the Canton Tower in the south to the Linhe West station in the north. Although the area was designed first in the late 1980s, businesses began moving in only when the APM was completed. 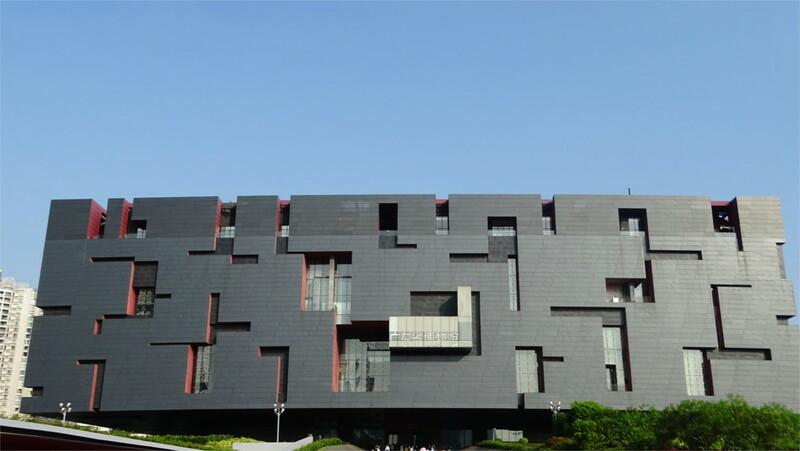 The Guangdong Museum was designed by the firm called Rocco Design Architects, who won an international competition for the design based on a puzzle called the ivory ball carving. To the north of this is the equally impressive Guangzhou public library, which I have written about earlier. In comparison to these, Zaha Hadid’s design of the opera house looks dull at first sight. TheIFC building which looms behind it catches the eye instead. However, when we walked in, the usual touches of Zaha Hadid’s designs became obvious in the fractured perspectives of the interior. Each view is interesting, and the design creates lots of visual barriers which restrict the view, converting the space into many little nooks which each give an intimate feeling. There was no show running. This seems to be a bit of a problem. International companies do not come here often enough, and the Cantonese Opera shows never seem to run here. Is there a little bit of a pricing issue at work? We couldn’t figure that out. The Family asked about tours of the interior and found that they are given in the mornings. We would have to come back another day. Our good intentions were not strong enough; we never came back for a tour. We took the APM and went on to see the Canton Tower. Shanghai is the acknowledged party town in China, but Guangzhou is no less. We spent the early part of an evening on top of the Canton Tower, taking a spin in the space pods. The rides here are great fun. I chickened out of the free fall, afraid of the state my spine might be in after a drop, but I regret missing it now. And late night, walking back home, there is always street food. China is fun. Looking for easy credits in college I came to a course called Photogrammetry. After this I was hooked to aerial photography. Many years later, I walked into an exhibition of photos by Yann Arthus-Bertrand in the Luxembourg gardens of Paris called “The Earth from the Sky”. This was a science made into art. With camera drones this has become easy today, when it is allowed. But for an amateur like me, the only way is still to take a window seat on a plane or to climb a high tower. 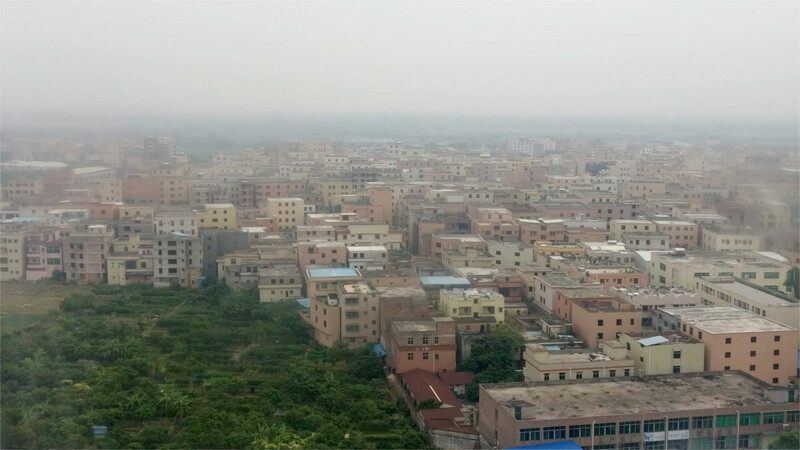 Coming in to Guangzhou, I looked past The Family, out of the cramped aircraft’s window, and saw a city where land and water mingled together. 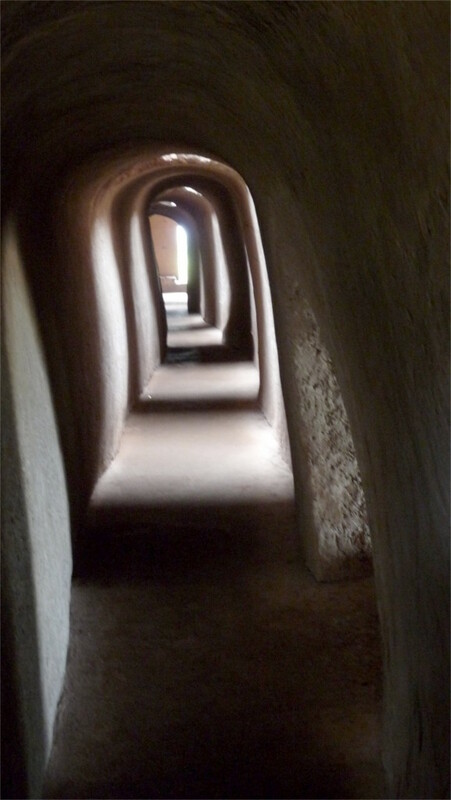 The first impression was of low houses in the baked-earth colours of southern Spain, but with flat roofs. The feel of Guangzhou on the ground is nothing like sparsely-populated Spain. This is, after all, one of the earth’s most crowded regions. Atmospheric haze is a major problem in tropical air. Even the cleanest of air will have so much water vapour that the saturated colours of Arthus-Bertrand’s photos are not visible to the eye. One can edit one’s photos to get a similar effect, at the cost of the reality of the tropics. Over a city the air is never clean. Although Guangzhou is not the most polluted city in the world, not even among the top 100, there is a definite haze visible from the air. 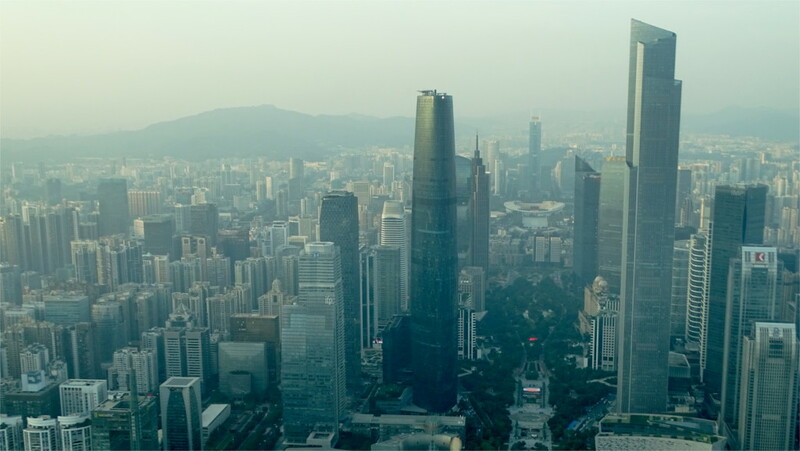 The views of central Guangzhou come from the top of Canton Tower. We managed to make it to the viewing platform of the tower in the golden hour before sunset. 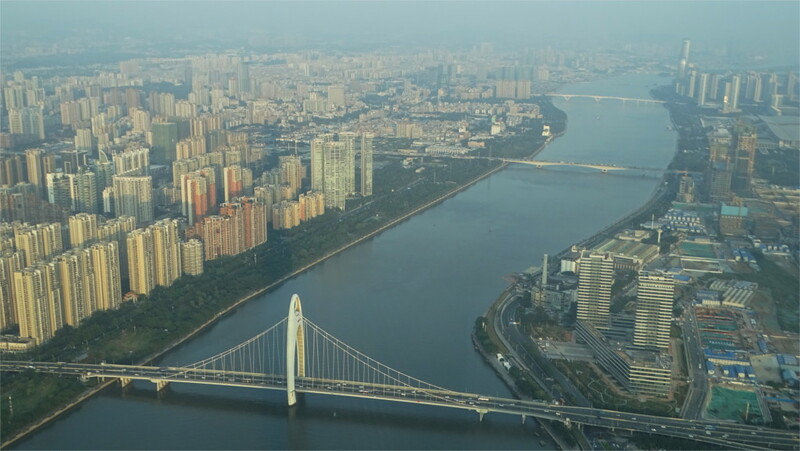 Looking east you can see the many bridges which connect the Huangpu and Panyu districts. We never managed to explore these two regions, although there are many historically important things to see in these parts of Guangzhou. The modern city is enormous, and includes many districts which historically were separate towns. Panyu was one of these. As evening fell we sat in a cafe in the Canton Tower and watched the enormous traffic jam centered on the nearest of these bridges. I was happy that we had elected to travel mostly by the metro. Looking west (featured photo) towards the posh district of Haizhu, taking a photo against the setting sun was a bit of a challenge. Later we would walk through this area, but for now one of things which intrigued me was the long island with the huge park which takes up much of the foreground of the featured photo. The photo above is of the Tianhe district in the last light of the day. This is the new town, with all the swanky high-rises and the signature buildings by the world’s major architects. They lie in the shadows at the base of the tall towers. 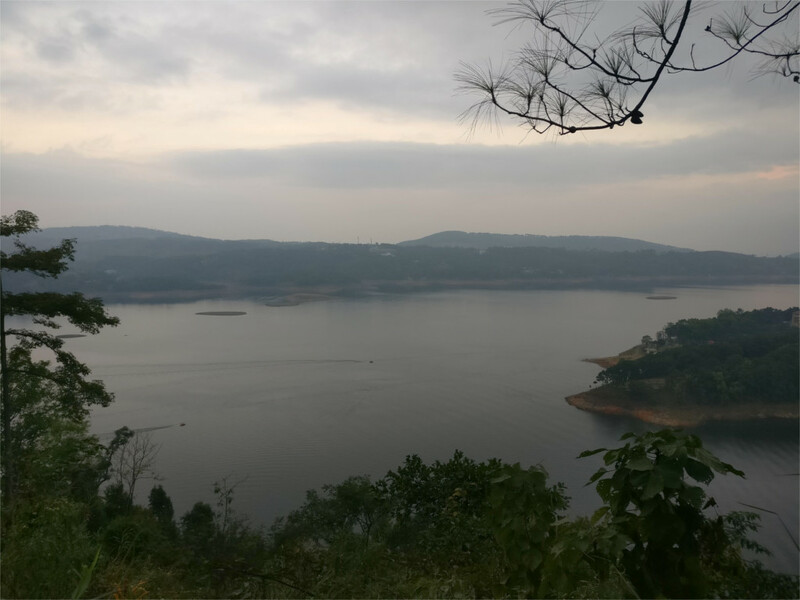 Beyond the high towers you can see the hills which are a special feature of Guangdong province. The Chinese word Tianhe translates into Sky River. The same translation works for the word, Akashganga, which describes the Milky Way in Sanskrit and other Indian languages. 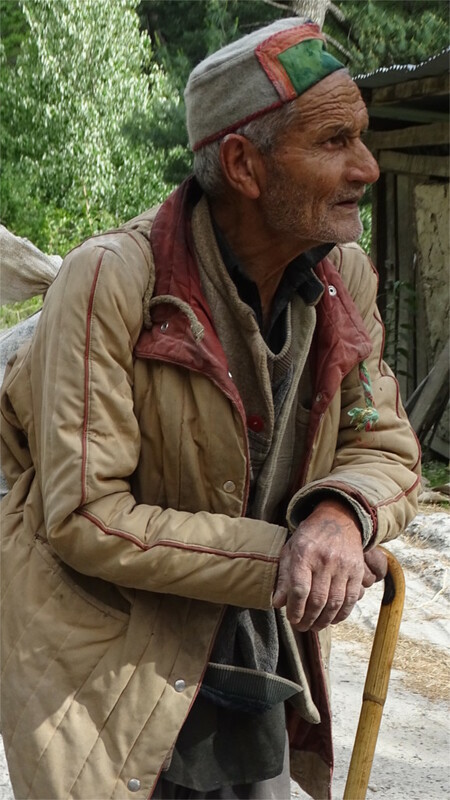 Akashganga. Tianhe. Which way did the cultural influence run? After lunch we wanted something sweet, and a box of walnut cake seemed to be just the thing. Between the two of us, The Family and I polished off a neat dozen of these little cakes. The machine which made them was quite as fascinating as the cakes themselves. Was the machine as old as the shop? I couldn’t get that question across. If you took Hans Christian Andersen as a historical source, then you would believe that automation in China is very old. Blind faith in fairy tales may be dangerous, though. This robot looked like a Rube Goldberg device, but actually got the job done quite efficiently. I also liked the sales patter from the man who attends to the machine, and the sing-song patter that you can hear on the soundtrack. That came from another worker in the same establishment. 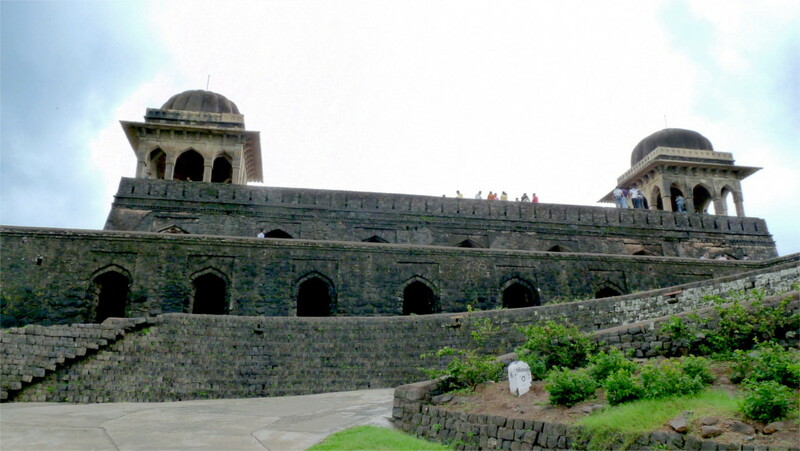 When we first visited Mandu almost a decade ago, The Family and I had just read a book where the sultan Baz Bahadur of Mandu and his queen Roopmati make a fleeting appearance. Enchanted by the fable of a singer-shepherdess marrying a musician-prince, we decided to start our trip from the very end of the citadel, where a former guard post had been converted to the private quarters of the queen. Baz Bahadur was the last independent ruler of Mandu, and ruled in the middle of the 16th century CE. Walking up to the pavilion, it was not hard to believe that this could have once held a garrison of soldiers. Looking out at the view, it was not hard to switch frames of mind and believe that it could have been a queen’s palace. Perhaps the most definitive evidence that a singer queen could have lived here are the two domed structures, one of which you see in the featured photo. I am no singer, but acoustics under this dome could almost make me sound like one. Little seems to be known about the queen beyond the obviously embroidered love story. 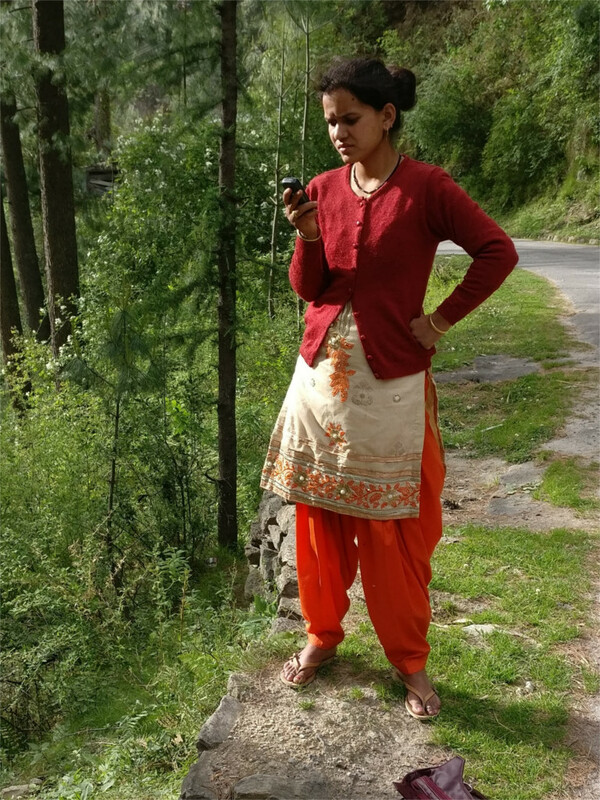 Comparing versions of her story from the early 20th and 21st centuries shows how the legend of Padmini has now been mixed up with the story of Roopmati. Even a cursory reading of a paper on her shows the degree of confusion amongst professional historians. Her story seems to have been first written down more than thirty years after her time, and copied from one manuscript to another until the middle of the 18th century CE. The painting of the couple which you can see in Delhi’s national museum was executed a century or so after their death. Some songs are ascribed to the queen, but they were first collected decades after her death, and may have been added to in the later manuscript which comes down to us. We looked out on the enchanting green landscape, a photo of which you see above. 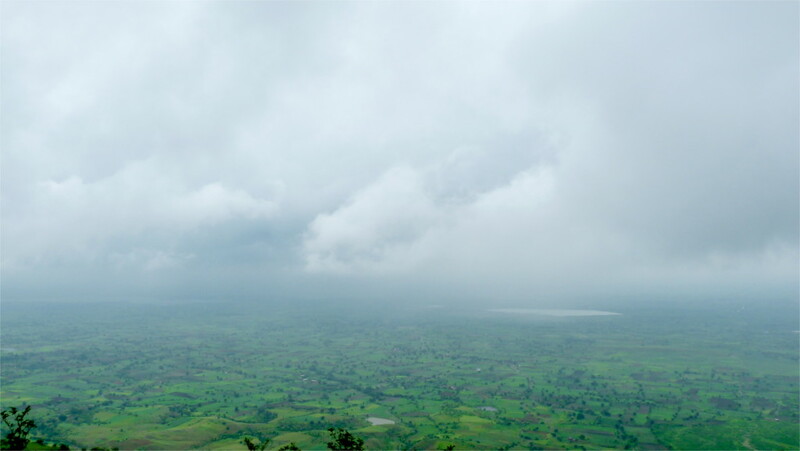 The green land around the citadel is watered by low hanging monsoon clouds. It struck me that the weather in the time of Roopmati was very different. The monsoon was well below today’s levels in the 14th and 15th centuries, leading to widespread droughts. 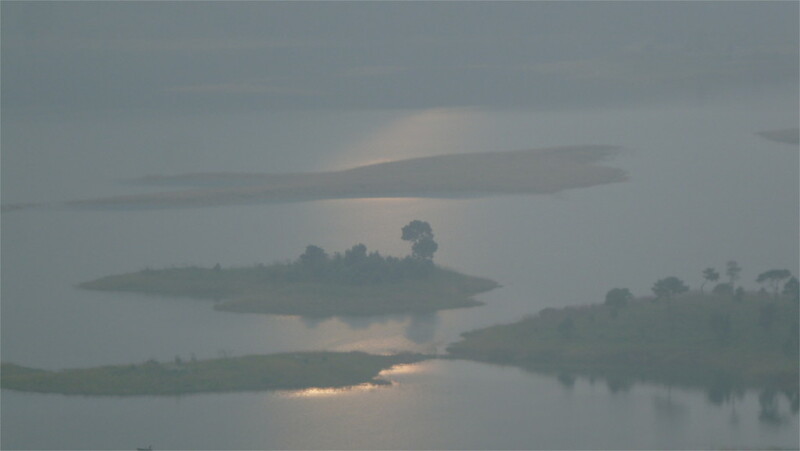 Even as late as the 16th century, monsoon rains continued to fail in central India. Roopmati, if indeed she stood in these pavilions, would have looked out on an arid land, with the glint of a distant stream providing the only water in view. The concern with water management and harvesting is very clear in Mandu. The multiple tanks and step wells are just one sign of this concern. We descended to the basement of Roopmati’s pavilion to look at water cistern there. My personal trawl through those photos threw up forgotten images of The Family and me walking through the wonderful chiaroscuro of the basement. The photo which you see above is the only one which does not contain us. The cistern is a terrific water harvesting system. Rain falling on the pavilion and around it drips into the cistern, presumably to be used by the garrison or the household of the queen. 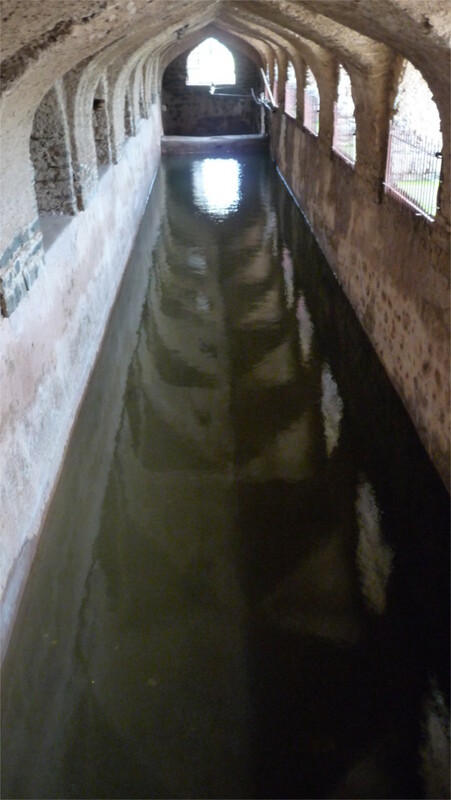 A paper on the water systems of Mandu says that the water was filtered through coal and sand; that’s the same principle as the charcoal and zeolite filter which gurgles away in a corner of our kitchen, five centuries on! In the brief two centuries since the little ice age the improved monsoon and irrigation systems have led to an amnesia about water harvesting. That period of plenty could come to an end soon, and the now-obscure methods could have a resurgence. 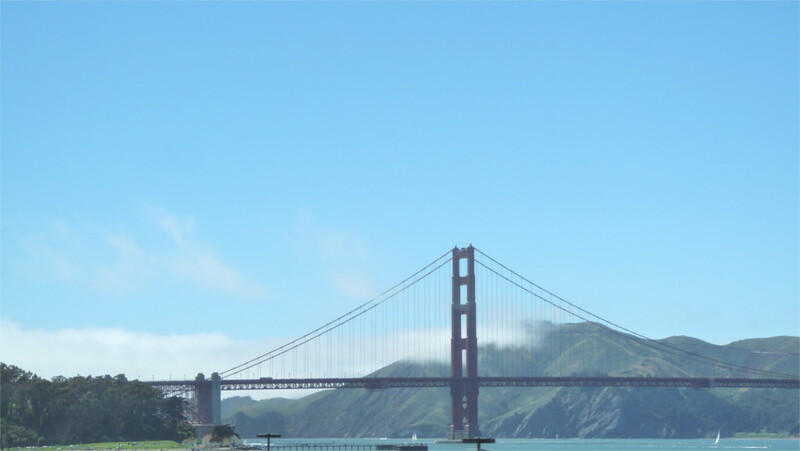 I continued with image-archeology and discovered photos of the most photographed bridge in the world. You take a risk doing this, because there is little that you can do that hasn’t been done before. And that little would probably involve something possibly illegal like flying a microlight through the suspension cables. I wasn’t going to try any of that, so I tried to leave out the bridge and capture the blue water and the early summer sunlight on a June morning eight years ago. The building that you see in the shadow of the bridge is the Lime Point lighthouse. That photo was taken from the north. I took a conventional full on view of the bridge from San Francisco as the fog began to roll in. At least, I thought it was conventional. Not so much, it seems. Most people today are aware of how very ordinary something like this looks, so it is more common today to seek a different viewpoint. 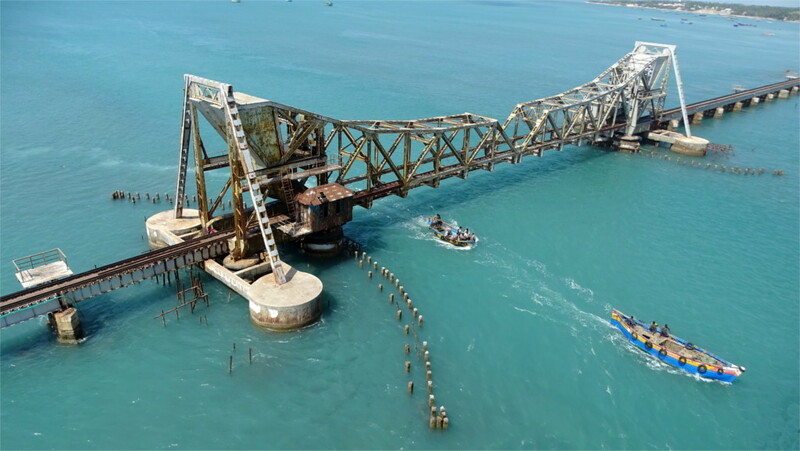 As a result, if you search for images of the bridge on Oodles, you will find a googol images which look nothing like this. I like the idea of being superlatively ordinary! 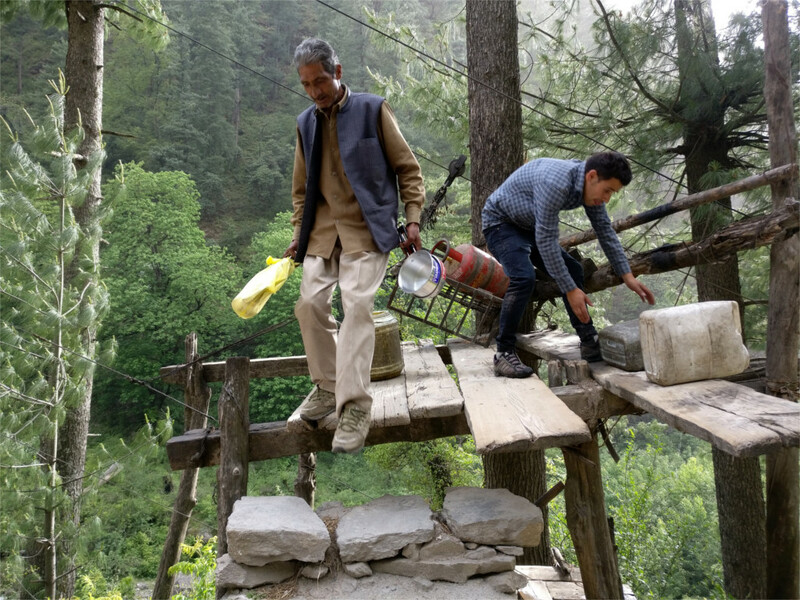 When you are walking on a mountain path you do not expect cylinders of cooking gas or other kitchen essentials to go sailing over your head (featured photo). But that is exactly what happens in Falachan valley. The whole valley is criss-crossed by overhead wires. I initially thought that there were a huge number of power lines here, but realized soon that most of the cables are luggage lifts. 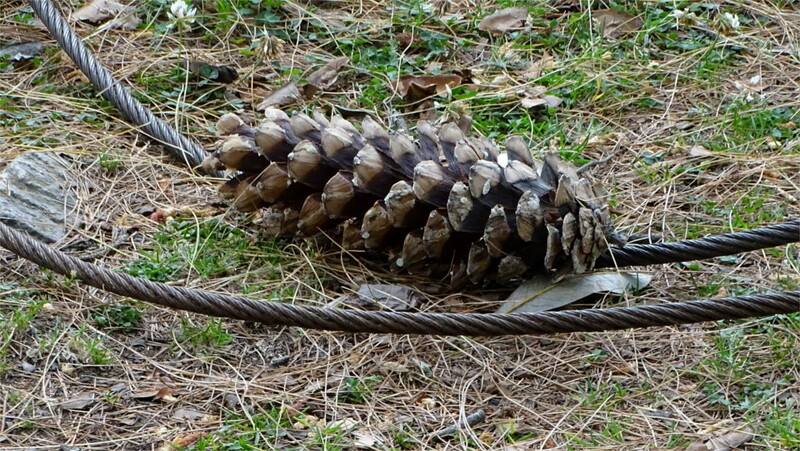 Sitting a few hundred meters above the river at the turning point of a climb I saw pine cones around me. Once I noticed the cables they were resting on I hesitated to pick them up; the cables could be live, and this could be a fire hazard, I thought. Later it struck me that the most likely source of these cables were the luggage lifts. Usually cable faults of this kind are attended to reasonably quickly (which could be a day up at these heights). Walking along the road we came across a family back from the market busy sending their stuff up to their home. I liked that loading station: at my head height, off the road. The cylinder of gas was already loaded into the cage which had come down from the village. Something must have been sent up already, and this cage was the counterweight. It was loaded with jerry cans of water. As we watched the young man poured the water down into the trees. The Family gasped. “Do they waste so much water?” she asked. Indeed, in many towns in hills water is scarce. But we saw lots of springs and glacier fed streams up here. Little villages are probably not short of water. Yet. The empty jerry cans go back up in the cage, along with heavy goods filling the rest of the cage. We weren’t the only spectators. An old man with a load on his back stood with us watching this family. These lifts are an innovation. Although this valley was dense with them, I didn’t see them much elsewhere. I guess the locals have figured out a way to string the lines between mountains, and that technique will take time to diffuse into the neighbouring valleys. It took me some time to puzzle through these thoughts. By the time I realized that there was something special about the Falachan valley, it was too late to ask someone how they string cables between hills.